This Rose course is suited to the professional as well as the amateur grower. The value of rose blooms extends beyond the ornamental garden; roses are grown for many reasons including: the cut flower trade, for perfume extraction, to harvest the hips and for rose oil. This course covers all these aspects and much more. Learn the history of the rose, the confusing rose classification system, how to identify the different species, their general cultural needs (soils, pests and disease management and pruning), how to use roses in garden design and how to produce a commercial rose crop. Roses, often referred to as 'The Queen of the Garden', are one of the most popular and prized ornamental plants. They are included in the greatest gardens in the world and many claim roses to be the most beautiful flower in existence. Introduction - identification & classification (modern and species roses are considered). Culture - pruning, nutrition, pests & diseases, planting, watering, etc. Propagation - seed, cuttings, layering, budding & grafting, etc. Climbers, Miniatures, Standards & Weepers. Using Roses - cut flowers, tubs, hydroponics. Distinguish between characteristic plant features in order to identify different types of roses. Determine cultural practices for growing roses in different situations. Perform all operations associated with pruning roses. Distinguish between the culture of different types of roses, including hybrid teas, floribundas and species rose groups. Plan the establishment of a rose garden. Plan the production of a commercial rose crop. Distinguish between the morphology of different groups of roses. Compile a resource collection of thirty contacts to assist with identification of roses. Prepare a collection of 32 photographs or illustrations of rose varieties. Identify the pests and diseases afflicting rose plants. Differentiate between the culture of roses in a greenhouse, and in the open ground. Compare the culture and application of Hybrid Teas, Floribundas and Polyanthas in a garden or nursery visited by you. Develop criteria for selecting rose varieties to grow as a commercial crop, for a specified purpose. Evaluate rose flowers offered for sale. Climbing Roses –These are rambling plants, which can grow very large, and will require training. It is very important to train them into the framework you want while young. Prune off unwanted growths every few weeks at first. Once a framework is established, the strongest growth will often be from the highest parts, and it can be difficult to initiate new shoots from lower on the plant. Many can grow stems 4m or longer from the base, upwards or outwards (whatever way you train them). Standard Roses –These are bush type roses that are grafted onto upright stems, producing plants around 1-2m tall (sometimes taller or shorter). Ground Cover Roses –These are creeping, or low growing plants that do not grow much more than 20-60cm tall, and usually grow much broader than their height. Weeping Roses –These are ground cover (creeping types), or scrambling types grafted onto tall upright stems, to produce an umbrella-like form. Miniature roses –small compact growing plants; with smaller flowers proportionate to their size. Hybrid Tea roses are the most popular group of roses. The flower stems are long and the blooms are usually on single stems or with several side buds. The flowers are very shapely, of medium sized or larger with many petals forming a central cone. They flower from late spring to autumn and make excellent cut flowers. Floribunda roses are often said to be more colourful then the hybrid tea rose as their flowering is more profuse, and they stand up to wet weather better, and are unrivalled for providing a colourful bedding display. The floribunda bears its flowers in clusters or trusses and several blooms open at one time in each cluster. It can be grown as a bush or as a standard rose and flower continuously from late spring to late autumn. Some of the earliest cultivated roses. A renewed interest in these roses has increased their availability. Long flowering periods and scents are the main attractions. They come in a variety of forms, mainly climbing or non-climbing. Choose roses of a form or shape that is proportionate to your garden. Small gardens will usually only accommodate smaller roses; but larger gardens can accommodate all sizes and forms. Climbers can be grown against a wall, over a pergola or arch; or used to create a tunneled walk. Weepers or standards make good features in the centre (or the back) of a garden bed, with lower forms in the foreground. For humid climates choose those varieties known to have high disease resistance. BUY ROSES IN WINTER ! Roses are commonly grown to be sold as bare rooted plants in winter. Rose nurseries dig their plants early winter as soon as the leaves fall; and send them off to the retail outlets. Plants can be held for months like this (as long as the roots are covered with a moist material such as sawdust), but as soon as the top starts growing, they need to be potted into soil. If you purchase roses early in the season, you will get a full range to choose from; but as the winter progresses, the available plants may only be are those left behind. If you buy roses in spring; you will often be paying extra for the soil and pot they needed to be planted into. When you purchase a bare rooted rose; look closely at both the roots and the stems. Don’t buy a plant which has diseased wood; large swellings on the roots, malformed roots (indicating disease or pest damage), dead root tips, or very uneven root growth. Look also for signs of insects and other pests. The most wonderful thing about roses is that they flower heavily; and for long periods. This makes them most useful for adding colour to a garden. Like most plants, roses look best when massed (ie. the more you plant together, the better they look). If you want the best effect from roses, think carefully about the colours you use. Consider the background to where the roses will be planted. If the backdrop is a dark wall or dark foliage; you need light coloured flowers for optimum contrast. 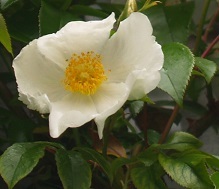 If the backdrop is a white wall, there is not much point planting white flowering roses. Mulch heavily in winter with lucerne hay or a seedless straw (This generates heat and insulates roots). Use drip irrigation, or only water roots…if leaves get wet, this promotes black spot & other fungal problems. Plant in an open position, and leave lots of space between plants for ventilation –if the plants are not well ventilated, disease develops rapidly over summer. Spray regularly for both insects & fungus. If you don’t like using sprays; roses can be difficult if not impossible in a hot humid climate. We also offer a eBook on Roses that any Rose enthusiast will find useful reading. There are few things as uplifting as being greeted by the sweet fragrance of roses from your own garden. If you have always wanted to grow roses, or perhaps improve an established rose garden, make sure you are armed with the right knowledge! Learn from the masters in horticulture. This wonderfully colourful ebook will teach you everything you need to know about the passion of growing roses. Gavin ColeB.Sc., Cert.Garden Design. Landscape Designer, Operations Manager, Consultant, Garden Writer. He was operations manager for a highly reputable British Landscape firm (The Chelsea Gardener) before starting up his own landscaping firm. He spent three years working in our Gold Coast office, as a tutor and writer for Your Backyard (gardening magazine) which we produced monthly for a Sydney punlisher between 1999 and 2003. Since then, Gavin has contributed regularly to many magazines, co authored several gardening books and is currently one of the "garden experts" writing regularly for the "green living" magazine "Home Grown". Growing and Using Perennial PlantsWhen designed and grown well, a perennial garden produces a blaze of colour for many months – starting in spring, flourishing through summer, and beyond into autumn. Scented PlantsScented plants can be either a delight or a curse. For many people, there is nothing more pleasing than a garden filled with fragrance, but for others who suffer allergies, certain plants can make them physically ill; sometimes very seriously. Getting Work in HorticultureFind out what it is like to work in horticulture; how diverse the industry is, how to get a start, and how to build a sustainable, long term and diverse career that keeps your options broad, so you can move from sector to sector as demand and fashion changes across your working life.